Delhi Doctors successfully remove a cyst 1.5 times the size of a tennis ball from the left abdomen of a 28-year-old man at a city-based hospital. By doing this they managed to salvage his leg. The patient Mr.Majid Nazir reported to the hospital with symptoms of persistent pain in his left leg and inability to walk for more than a few meters without strain, associate director and head of GI surgical oncology at the Max Super Speciality Hospital in Shalimar Bagh, Rudra Prasad Acharya, said.The patient was subjected to an MRI which revealed an unidentified pelvic mass, he said. 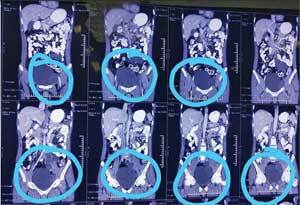 The patient was referred to the oncology department and another CT scan and angiography revealed a big fluid-filled cystic mass of 10 cm by 8 cm in his left abdomen, the doctor said, adding that its size was around 1.5 times of a tennis ball. “The cyst had begun to press against his left femoral artery and had led to a very feeble pulse. In fact, from the scans, it seemed the cyst had replaced his artery function and led to a decreased blood flow. “The patient was in grave danger of losing a limb due to the restricted blood flow,” he said. Dr. Dinesh Kumar Mittal, a senior consultant at the hospital, said the cyst had been growing undetected in the patient’s body for nearly six years and was full of “multiple daughter cysts”. Then an artificial vessel was created through a vascular graft to replace the iliac artery and re-establish circulation between the Aorta, the largest artery in the body, and the left femoral artery in the thigh. “This ensured that regular supply of blood is maintained to the patient’s limb, saving him from a potential loss of the left leg. Regular follow-ups every three months ensured that the chances of recurrence are minimized,” Acharya said. “Hydatid cysts in abdomen and lungs are very common. However, when we began operating on Nazir, we realized that the cyst had grown into the lumen of the artery and one of the daughter cysts had even extended into the Aorta, putting the patient at grave risk of extensive blockages. “The biggest challenges for us were to ensure that the entire cyst, including all the daughter cysts, are removed and that a new Iliac artery can be grafted since the previous one had been destroyed by the cyst. This helped us to restore blood flow and save the patient’s limb,” Mittal explained. The patient had removal of a similar Hydatid cyst in 2012 which had developed in his chest. The cyst had ruptured and it is likely that some portion had entered into the Aorta and settled in the Iliac artery, eventually replacing it and growing steadily, he said. Hydatid cyst is one of the oldest and most persistent public healthcare problems across the world. It may be caused when the tapeworm Echinococcus goes through its metacestode stage to form larvae. Most human infections worldwide are caused by E. granulosus that causes cystic echinococcosis. They can be found in any organ but in adults, the liver and lungs are the most common locations. In India, rural regions in Andhra Pradesh, Tamil Nadu and Jammu and Kashmir, have seen the highest incidence of such cysts due to improper disposal of animal waste, according to the hospital. It is usually spread through eating food items which have somehow been infected by animal faeces.